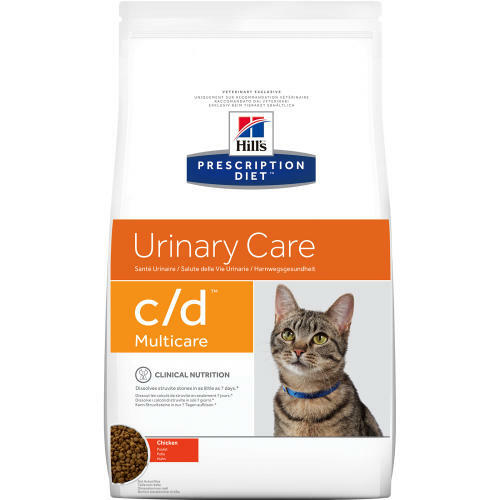 Feeding Prescription Diet c/d Multicare Feline Chicken makes it easier to effectively maintain a healthy urinary tract and reduce the risk that stones will re-occur after dissolution. Dissolves sterile struvite stones in as little as 14 days and reduces recurrence. Suitable for long term feeding – no need to change food. Great taste to get your cat eating. Also available with Ocean Fish. Rice, chicken (35%) and turkey meal, wheat, maize gluten meal, animal fat, digest, minerals, fish oil, soybean oil, trace elements and beta carotene. Preservative and antioxidant. Beta-carotene 1.5 mg/kg, Calcium 0.0072, Carbohydrate (NFE) 0.404, Chloride 0.0088, Fat 15.6, Fibre (crude) 0.009, Magnesium 0.0006, Moisture 0.055, Omega-3 fatty acids 0.007, Omega-6 fatty acids 0.03, Phosphorus 0.0066, Potassium 0.0076, Protein 32.4, Sodium 0.0035, Sulphur 0.0064, Taurine 2360 mg/kg, Vitamin A 5790 IU/kg, Vitamin D 610 IU/kg, Vitamin E 550 mg/kg.